Tidewater Beach Resort is a beautiful condominium completed in 2007 located on the west end of Panama City Beach, Florida. Many of the condo owners at Tidewater Beach Resort rent out their units as vacation rental condos on a weekly or monthly basis. If you’re looking to rent these condos for your family vacation, it only makes sense that you’d want to know which condo has which floor plan. Luckily, we have all of the information you need in one place. Let’s take a look at what floor plans the resort has to offer. Note: Each unit has a 3 or 4 digit unit number. 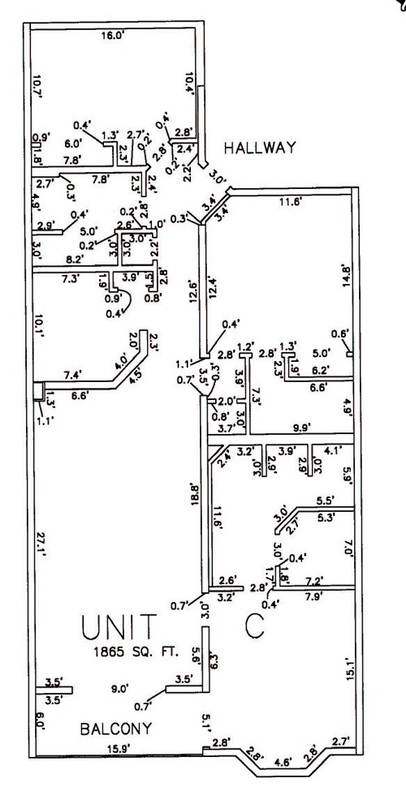 The first one or two numbers is the floor number and the last two numbers are the floor plan number. 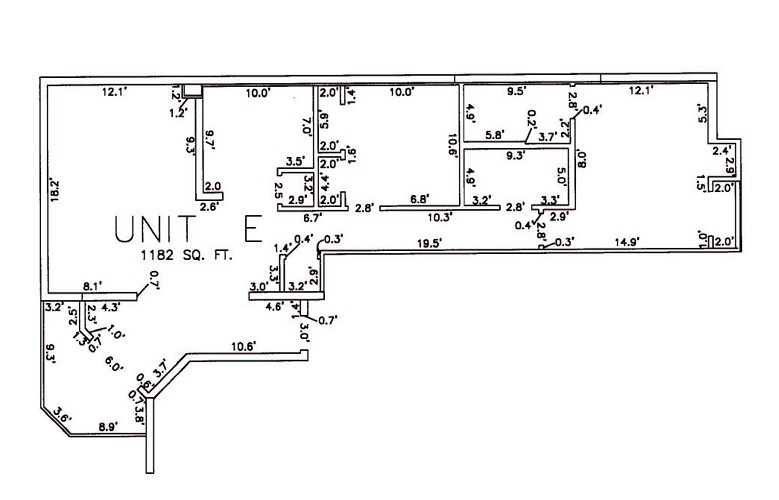 Tidewater only offers one of these floor plans, Unit N, and they are in units that end in 18. These units are located on the very east end of the building and are set back from the beach a bit. They still have great views, including one of the two gulf front pools. 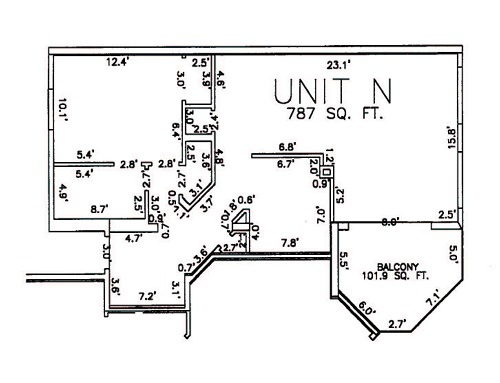 This floor plan is 787 square feet. As you enter the condo, a bunk area will be on your right hand side. Continue down the hallway and the one bedroom and bathroom will be on your left. At the end of the hallway is a small closet and the entrance to the kitchen, dining area and living space. You’ll have windows on the north and east sides of the building and a balcony facing south toward the gulf. There are three different types of these one bedroom/two bathroom with bunk area floor plans at Tidewater Beach Resort. Combined, these layouts make up eight units on each floor of the condo. 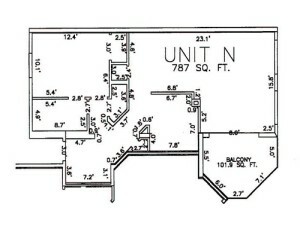 The first floor plan is Unit B and features a 934 sq ft layout. 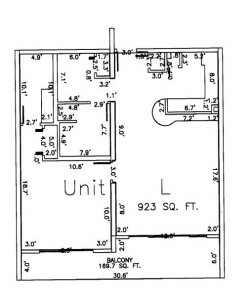 All units ending in 04 have this floor plan and it’s one of the larger one bedroom layouts. As you enter this beach front floor plan, the one bedroom will be immediately on your right. This bedroom has its own private bath along with a closet. As you enter the unit, a bunk area will be immediately past the bedroom door. A little bit further down the hall, you will find the second bathroom on your right. The unit then opens up to the living/dining area and the kitchen will be on your right. Straight ahead will be the breath taking views of the beach and Gulf of Mexico on your private balcony. 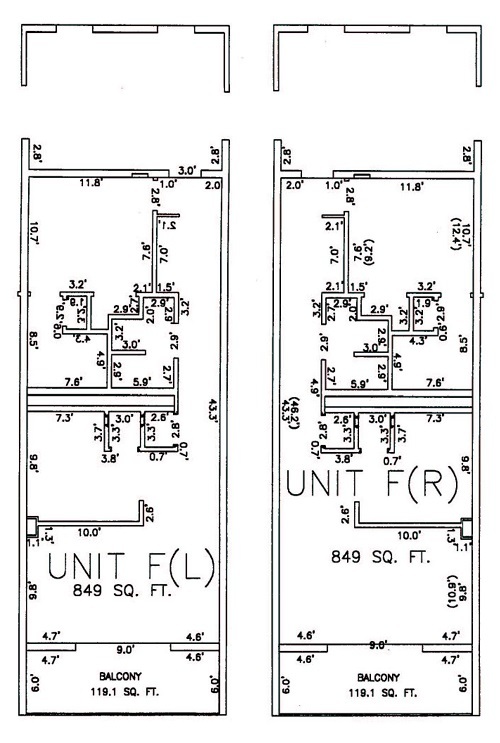 The second floor plan is Unit F and it comes in two versions that mirror each other. They’re each 849 square feet. 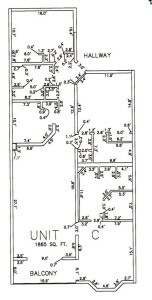 Units with this floor plan end in 06 or 07. Just like with the Unit B layout, as you enter a bedroom will be immediately on one side as you enter the unit quickly followed by the bunk area. The bedroom has its own private bath and a closet. Walk down the hall a bit further to find the second bathroom followed by the dining/living area and kitchen. These units also have gulf front balconies with amazing views of the beach and gulf. 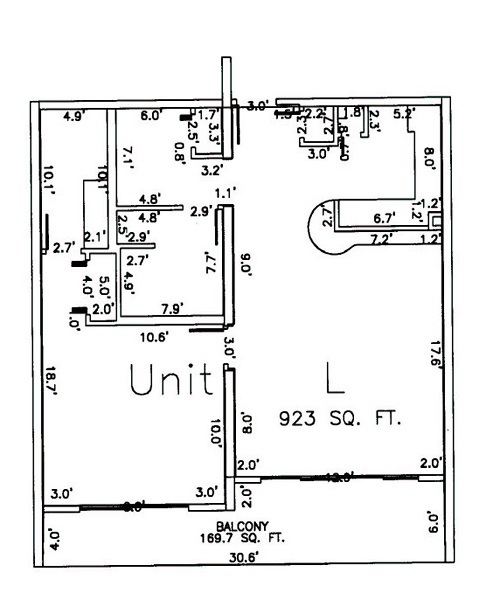 The third version of the one bedroom/two bathroom with bunk area floor plan is the Unit H at 934 square feet. 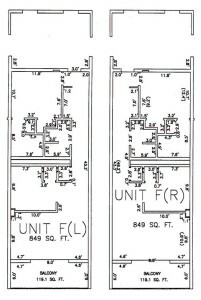 Unit H can be found in units that end in 03 and is very similar to the other one bedroom/two bathroom units we’ve described so far. As soon as you enter the unit, you’ll find a bedroom and private bath on the right hand side. The bedroom is immediately followed by a bunk area and bedroom, both on the right, as you walk down the hallway. The hallway opens up into the living/dining area with the kitchen on the right and the amazing balcony views are directly in front of you. 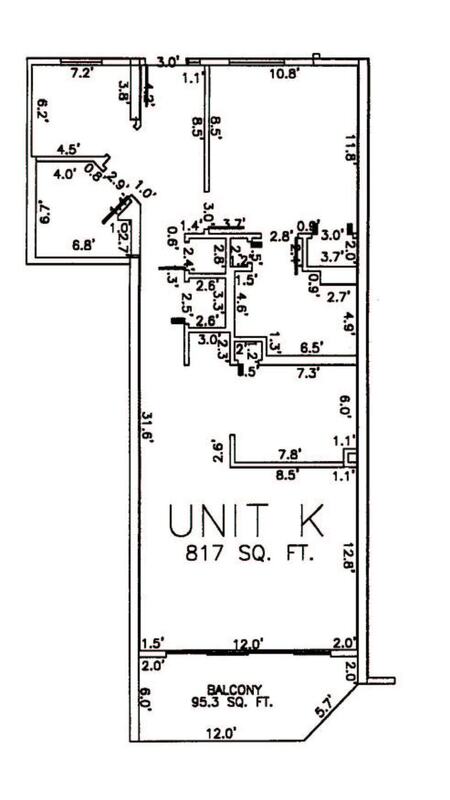 Just when you thought all of these floor plans would be close to the same, Unit K changes things up just a bit. These layouts are found in units that end in 16. 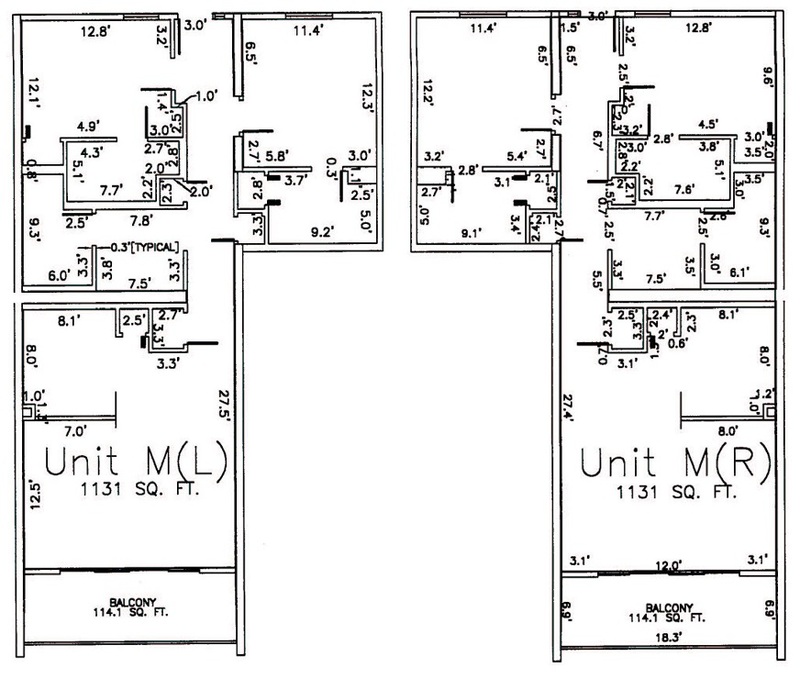 The Unit K floor plan is the smallest of the one bedroom/two bathroom with bunk area layouts at 817 sq ft, but they are well laid out. As you enter the unit, you’ll find the bunk area and its bathroom on the right hand side of the unit. To the left, you’ll see the bedroom which has its own en suite bathroom. As you continue down the hall, the units opens up to the living/dining area with the kitchen on the left hand side. These units have unique balconies as they have one side that is slanted and isn’t blocked with a retaining wall. It opens up your view to see even more of the beautiful Florida Gulf Coast from your unit. The last one bedroom/two bathroom with bunk area floor plans is my personal favorite. Unit L has a layout with 923 square feet and is the only one bedroom/two bathroom with bunk area floor plans with a gulf front master bedroom! How awesome is that!? Unit L is found in units that end in 09, 12 or 15. As you enter these condos you’ll see the kitchen immediately on your left and the entrance to the bunk area and first bathroom on your right. Straight ahead is your living/dining area and an amazing view through the sliding glass doors that lead to the balcony. As you walk through the living area, on the right you’ll see an entrance to the gulf front master bedroom that comes with its own private bathroom. This gulf front master bedroom has it’s own sliding glass door that leads to the largest balcony of all of the one bedroom condos in Tidewater Beach Resort. There are two different two bedroom/two bathroom floor plans at Tidewater Beach Resort and these do not have bunk areas. 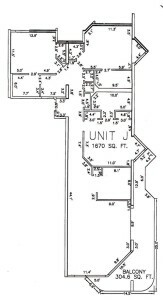 The first floor plan is Unit A and it has 1,593 square feet. 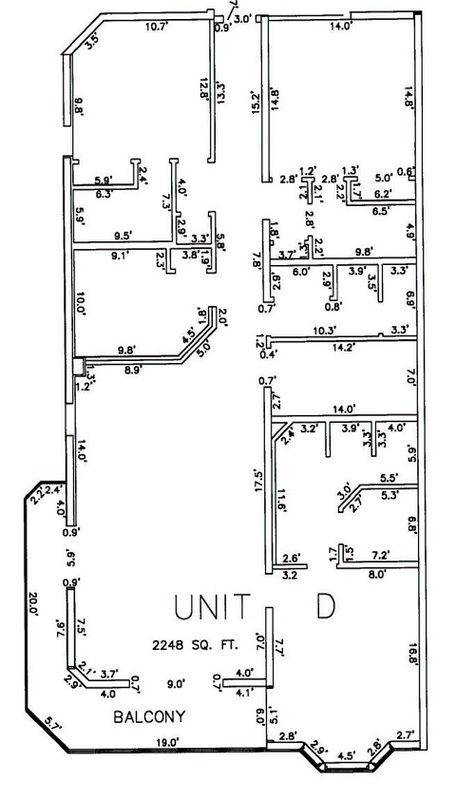 These floor plans are found in units that end in 05 or 08. As you walk into the condo, you’ll find the kitchen on your right and the first bedroom and bathroom on your left. The bathroom has entrances from both the bedroom and the hallway. Straight ahead is the living/dining areas and the standard sized beach front balcony. On the left hand side in the living area is the entrance to the gulf front master bedroom with its own private bathroom. The large bedroom has a bay window that extends beyond the rest of the condo for amazing gulf front views. The master bathroom is larger than the standard condo bathroom and has a separate bath tub and shower and his and her sinks. They also have a walk in closet! That’s not all, this unit has a sliding glass door from the master bedroom to the balcony, too. 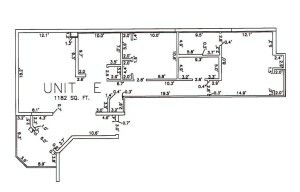 The second two bedroom/two bathroom floor plan (with no bunk area) is Unit E with 1,152 square feet. 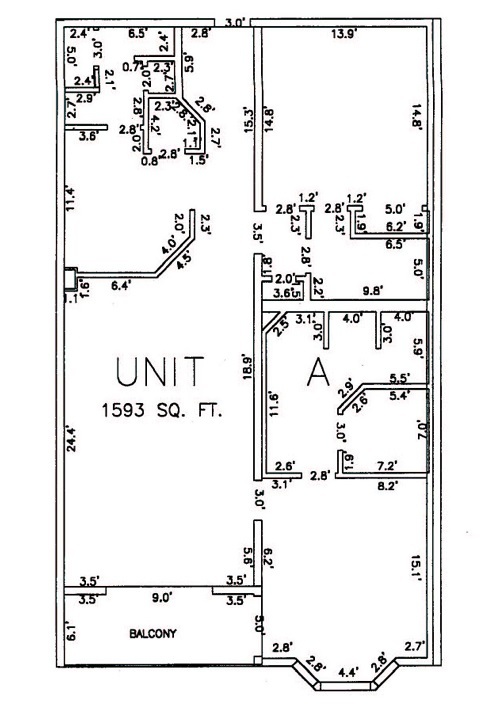 Unit E can be found in units that end in 00 and they are on the very west end of Tidewater Beach Resort. Like the one bedroom/one bathroom Unit N, they are set back a bit from the beach, but the balcony still has amazing views of the Gulf of Mexico, the second of two gulf front pools and the beach. These two bedroom/two bathroom layouts have windows on the west and north sides of the building and bring in plenty of natural light. As you walk into the unit, you’ll see your south facing balcony straight ahead. To your right, you enter into the living/dining and kitchen area of the condo. Down the hallway to your right are the two bedrooms. The first bedroom is on your left and just past that is the first bathroom. Straight ahead down the hallway is the master bedroom with it’s own private bathroom. There are only two two bedroom/three bathroom with bunk area floor plan in Tidewater Beach Resort, but they mirror each other exactly and are 1,131 sq ft. 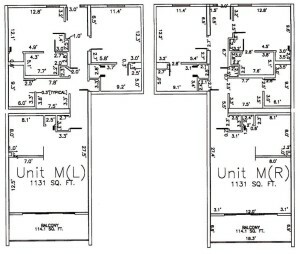 This floor plan, Unit M (L) can be found in units that end in 11 and 14 while Unit M (R) can be found in units that end in 10 and 13. As you enter the unit, the one master bedroom with a private bath will be on each side of the hallway. As you continue down the hallway, an opening on one side will lead you to the bunk area and third bathroom in the unit. As you continue down the hallway, the condo opens up into the living/dining area and the kitchen will be on your right or left depending on which mirrored version of the layout you’re in. Straight ahead is the typical beachfront balcony in Tidewater Beach resort with amazing views of the sand and surf. Tidewater Beach resort has only one three bedroom/three bathroom floor plan that doesn’t have a bunk area, but it is huge and comes in at 1,865 sq ft. 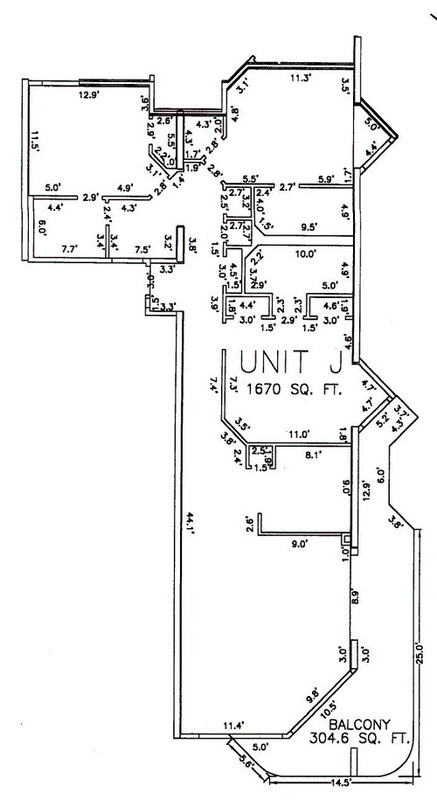 This floor plan, Unit C, is found in units that end in 02. As you walk into this unit you’ll have the first bedroom immediately to your right. Straight ahead is a hallway bathroom for the entire unit to share. As you turn to your left and walk down the hallway the kitchen will be on your right and the entrance to the second bedroom with its own private bathroom will be on your left. As you pass the kitchen, the condo opens up into a dining/living area that ends with a sliding glass door leading to an amazing gulf front balcony. Further ahead on the left is the entrance to the master bedroom with an amazing private bathroom. This bedroom has a bay window that extends out from the building to show the amazing gulf front views up and down the beach. The bathroom has a walk-in closet and a separate tub and shower. It also has dual sinks! One last note about this amazing bedroom is the fact it has a sliding glass door that leads out to the balcony. The final two floor plans in this Panama City Beach condo are both three bedroom/three bathroom floor plans with bunk areas. 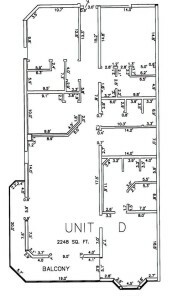 The first is Unit D and is the largest, most amazing floor plan in Tidewater Beach Resort. It has 2,248 square feet and can be found in units that end in 01. When you enter this condo, you’ll have to take a few steps before you have to make a choice about whether you should enter the bedroom on your left or the bedroom on your right. The bedroom on the right has it’s own private bathroom. The bedroom on the left has a bathroom you can access from either the bedroom or the hallway. As you continue walking down the hallway, the floor plan opens up with the kitchen on the right and an storage area on your left. Straight ahead is the amazing living/dining area that opens up to two sets of sliding glass doors and a breath taking wrap around balcony. A little bit further ahead on the left is the bunk area. If you continue into the living area, the master bedroom will be on your left. This gulf front master bedroom has an amazing private bath with dual vanities, a separate bath and shower and a walk in closet. The gulf front master bedroom has a bay window that extends out from the building to showcase the amazing views up and down Panama City Beach. The bedroom wouldn’t be complete without mentioning the sliding glass door that opens up onto the wrap around balcony with views that will blow your mind. 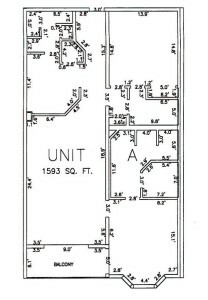 The last floor plan in this condo building is Unit J, a 1,670 square foot three bedroom/three bathroom with bunk area floor plan. 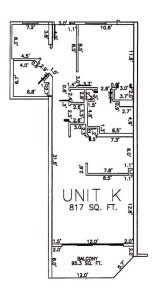 Unit J layouts can be found in units that end in 17. If you take a left when you enter this unit you’ll find the bunk area and first bathroom on your left, as well as the first bedroom. On the right you’ll find the second bedroom with a private bath. The bedroom has a unique window that extends out from the building to give you an amazing beach view. Starting from the entrance of the condo, if you take a right, you’ll find the third bedroom on your left side with its own private bathroom. This bedroom has a similar window extension for another amazing view. The bathroom features two sinks. The hallway opens up to the kitchen on your left and the living/dining area straight ahead with some utterly amazing views. Straight ahead are floor to ceiling glass windows, along with two sets of sliding glass doors leading out onto a wrap around balcony that is to die for. 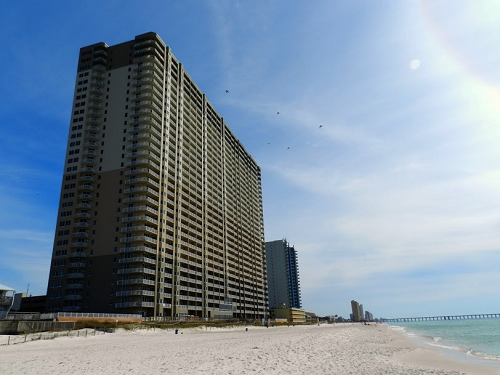 The balcony on this unit faces both to the south and to the east for amazing views all the way down Panama City Beach. Hopefully our descriptions of these floor plans have helped you pick your perfect vacation rental condo in Tidewater Beach Resort. Make sure to check out the rest of MyBeachInsider.com to learn more about Panama City Beach, Florida condos and things to do on your beach vacation.